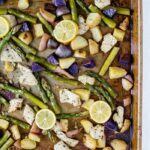 A quick and easy lemon garlic chicken sheet pan meal that combines chicken, asparagus and potatoes all in a light lemon garlic sauce. Perfect for busy weeknights. Gluten-free + diary-free. I’m on a mission to make healthy eating easy, accessible and delicious. It’s when I come up with meals like this that I know I’m right on track. It doesn’t get much easier than this as the ingredients for this lemon garlic chicken sheet pan recipe can be found in pretty much any grocery store and the combo of flavors is really tasty. I don’t live in a tropical climate so I’m always super excited when spring rolls around because I know our local farmers market is going to start carrying a lot more options! Asparagus is one of my favorite spring vegetables. I personally LOVE roasted asparagus so I decided to build this meal around it. I complimented it with potatoes, chicken for protein and a lemon garlic sauce full of herbs, olive oil, maple syrup, lemon and garlic. So light and refreshing, perfect for spring! The one essential item you need for a sheet pan dinner is: a sheet pan. Any ol’ baking sheet will do, but I have a large one that I like using for sheet pan meals because it gives the ingredients plenty of space to roast instead of steam! 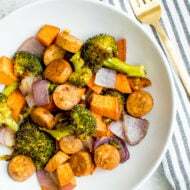 From there, I like to use a mix of protein and veggies to make up the meal. 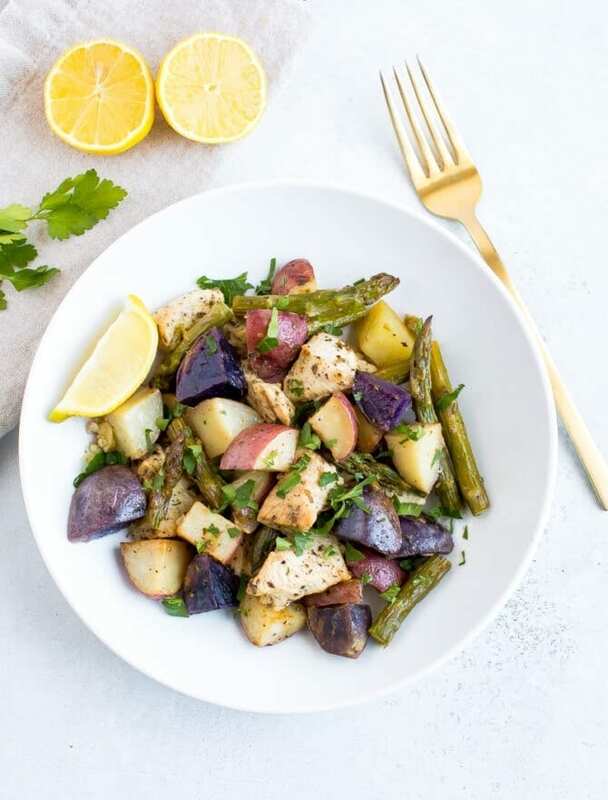 This recipe uses chicken breasts, asparagus and potatoes. 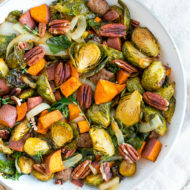 One thing you have to be mindful of when you’re making sheet pan meals is how long it will take each ingredient to cook. For instance, with this sheet pan meal, I knew the potatoes would take longer to cook than the asparagus and the chicken so I roasted those alone for 20 minutes while the chicken marinated and then added everything else to the pan. I am loving this combo of chicken, asparagus and potatoes AND the fact that everything is cooked on one pan so the clean up is a breeze! 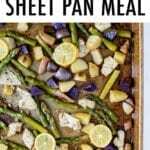 If you make this lemon garlic chicken sheet pan meal, please be sure to leave a comment and star rating below letting me know how it turns out. Your feedback is so helpful for the EBF team and other EBF readers. 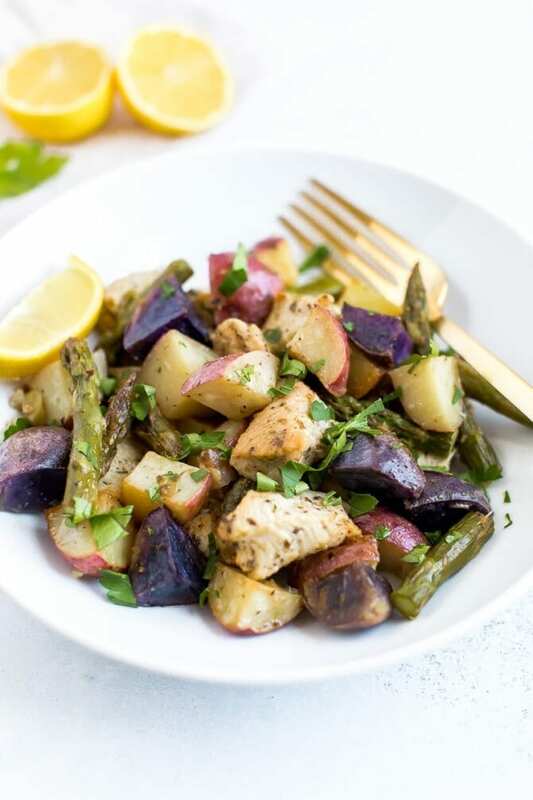 A quick and easy lemon garlic chicken sheet pan meal that combines chicken, asparagus and potatoes all in a light and tasty lemon garlic sauce. Preheat oven to 400*F. Coat potatoes with 3 Tablespoons of the lemon garlic sauce + an additional Tablespoon of olive oil. Roast for 20 minutes. Meanwhile let chicken chunks marinate in remaining sauce. Once potatoes have roasted for 20 minutes, toss and add chicken with sauce along with asparagus to the pan. Place pan back in the oven and roast for 15-25 minutes or until chicken is cooked through. Enjoy warm. I’m looking forward to trying this one out. 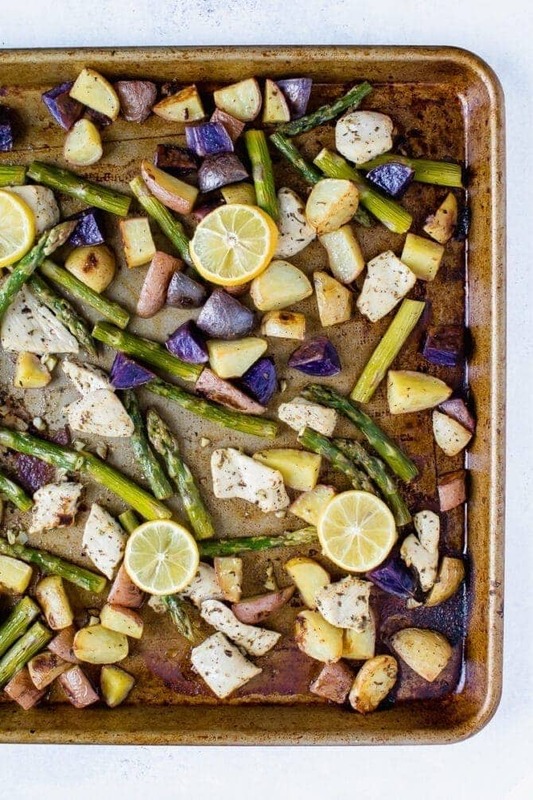 I’m a big fan of sheet pan meals and have LOTS of lemons right now. Wonderful. I am so happy your whole family enjoyed this one. Love it when that happens. My family and I are so incredibly sick of the same ol’ chicken dinners! I actually have everything needed to make this, so it’s going on the menu for tomorrow night! That’s good to know that you need to be aware of how long each item will need to cook and put in the ones that need more time first before adding more. This is helpful since I’m trying to find some healthy, easy meals I can make for my kids since I work. 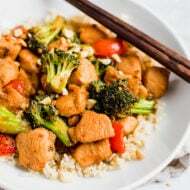 I’ll have to find some cooking blogs with sheet pan recipes so I can get an idea of what to cook and how long to cook it. fantastic read!! I definitely really liked every bit of it.